The last few days have seen some of the warmest weather we have seen all winter in the state of Colorado. Locations from the mountains, to the western slope, to the front range have been trending well above average. In fact, most of the U.S. in general saw above average temperatures over the last few days. The temperature anomaly map illustrated what I have affectionately termed the “Blow Torch” that has been our weather for most of February. 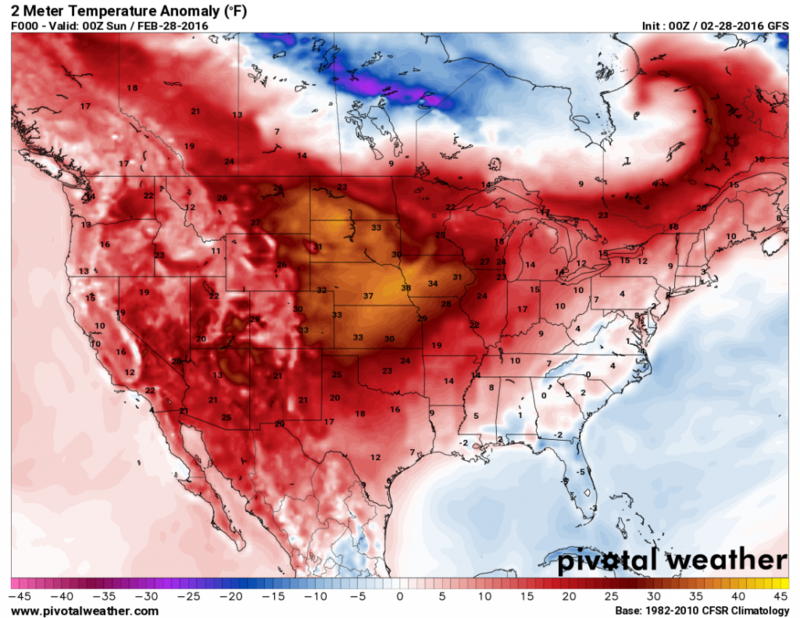 I’ve discussed before how this is not entirely unusual for February as most Colorado natives will recall that February generally tends to be one of our calmer and warmer months during the winter season. With that in mind, our average high for for this time in February is int he 40’s so our high of 71.5 in Castle Rock was well above average today! Early March Outlook and When Does the Pattern Change? The big takeaways here are the much above average chance of warmer than average temperatures and the equal chance of above or below average precipitation. An equal chance does not give us a lot of information about whether it will be wetter or not in the next 6-10 days so we need to look at something else to see. When I look at the models for the next week I see something that is very similar to what we’ve seen for the last few weeks, a big ridge camping out over the Western U.S. This will keep us warm and dry overall. 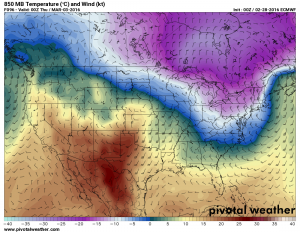 Euro – Notice the ridge of warm air stationed over the Western U.S. Looking at several different models for the next 7 or so days, you see this ridge feature in every single one. This gives me relatively high confidence of a warmer and drier period over the next week or so. There is a chance of a disturbance or two this week, the forecast calls for a chance of rain or snow early in the week but honestly when I see things like this it does not give me much hope that the chance of precipitation will be decent. I would not be surprised to see many areas get no rain or snow along the front range this week. The mountains may squeak out a few inches here and there but this pattern is not conducive to large, wet storms for us. As I show you the Climate Prediction Center outlooks for the 8-14 days you will notice many similarities to the 6-10 day period. One thing to notice though is that event though the ridge remains over the U.S. it has shifted to the East of Colorado for the most part. I’ve mentioned in the past that we would look to late February or early March for a pattern shift to signal a stormier March and April. 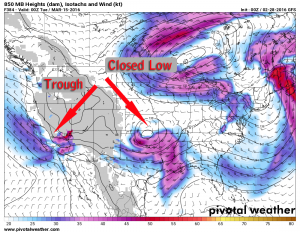 This may be one of those signs, the shift in the ridge along with the increased chance of above average precipitation (image on the right calls for a high chance of above average precipitation) may be the outlook just beginning to pick up on a signal of chance in the atmosphere. This image shows the GFS model about as far out as it will go. 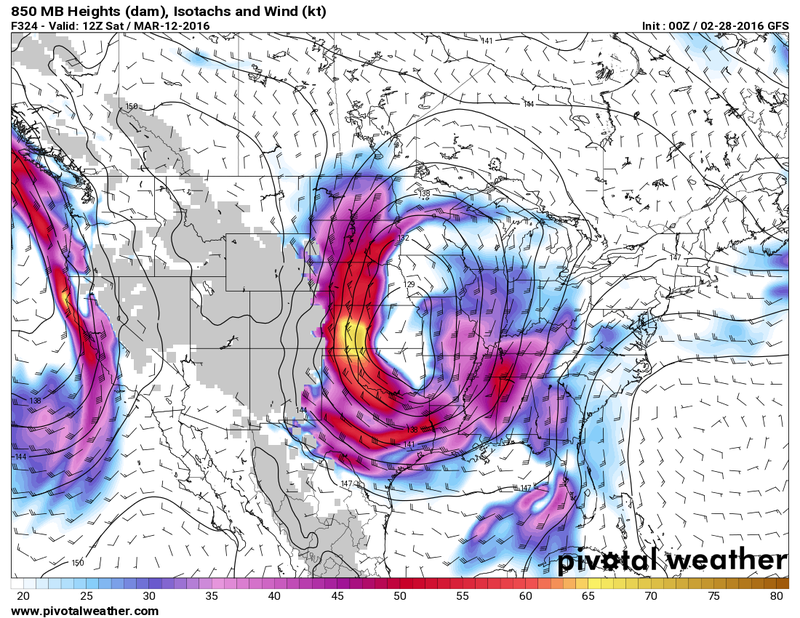 This shows mid-lower level winds and features for 5am on Saturday March 12. 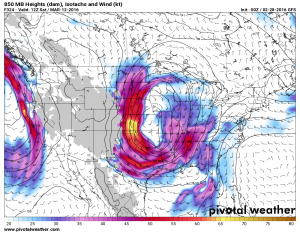 Notice the rather large trough feature in the middle of the U.S.
As this is very far out on the GFS’s scale, the accuracy of the position is not what we are looking for here. What we are looking for is that this model is picking up on some sort of large trough feature around this time period. If we forward this model to as far out as it will go (Monday March 14 at 5pm) we see a couple of other interesting features. Again position is not important here but the appearance of a closed low to our East and a trough to our west is encouraging. Seeing features like this develop raises another flag about a possible pattern shift sometime in mid to late March. Troughs showing up in the atmosphere is something we have not seen most of February and was responsible for our abnormally warm and dry weather. If these troughs do indeed establish in March, we could be looking at a period of extended storminess. The next week to two weeks is going to feature more of the same for the front range of Colorado. Expect warm temperatures and dry, windy conditions. Expect this pattern to likely stay established through 10-14 days, however towards the end of the 14 day period we will be looking to confirm the model’s prediction of a pattern change. This would mean a wetter and stormier middle and second half of March. Keep in mind, if temperatures remain well above average (very possible) a lot of this moisture could fall as rain or heavy wet snow. This would be a similar situation to what we saw in October along the front range of Colorado. I will be showing these models a lot over the next week or two as I try to confirm if we get a pattern shift towards the second half of the month. If this verifies, we could start to see more interesting weather by that time period.